The navigation app provides the ability to import traces that allow to follow a track made by someone else. The GPS app will indicate your current location against the track. If you buy our guides, either pdf or printed version ordered via this web site, you get a complimentary link to download our traces 😉 . Unzip .gpx files on your desktop: right click on zip file, extract all. Dol-1_GPXs folder: *.gpx : filename is the name of our trails in the Guidebooks. Assuming *.gpx folder is on your desktop. Connect the Smartphone to PC via USB cable. 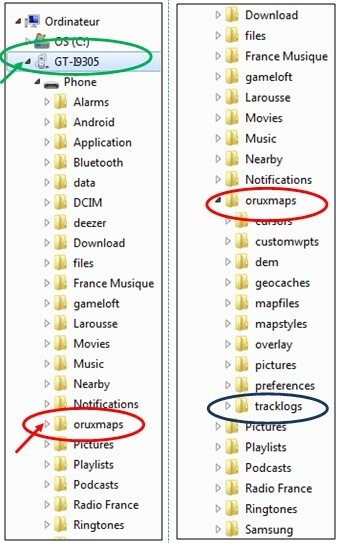 Open folder « oruxmaps » ( red). Copy *.gpx from the desktop Dol-1_GPXs folder and Paste into folder « tracklogs » on your device (blue). Look for websites sharing hikers’community Traces, Routes, WayPoints. Double check the quality and reliability of any trace, it can be hazardous to follow, BEWARE !. Now, you can learn how to follow a track.